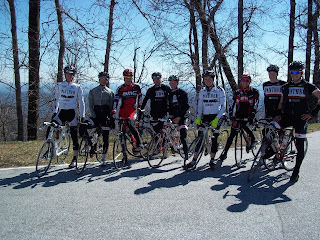 This past weekend was the official Panther pb Competitive Cyclist team training camp down home in Greenville South Carolina. I met up with Gabe Thursday after work for the 6 hour drive down to the cabin. The team training camp experiences I’ve had in the past have usually involved cramming as many guys into as small of a tent/crappy cabin as clown car logic will allow. But this is the Elite Panther Cycling team, it’s the big time. Not only did pretty much all of us get our own bed, and bathroom, my room even had a vintage Donkey Kong/Centipede arcade system. Camps are usually a good time to get to know the team and get a feel for the strengths people have. This was particularly needed for the 2012 team. After loosing several riders in the off season shuffle, there were significant holes in the diesel section of our team. The only returning riders from last year were Kirk, Ryan A, Ryan K, and me (all the truesport proclaimed fast guys). I only raced with Ryan A (the guy who probably pulled the studliest results last year at Joe Martin and Nature Valley) once last year at Gateway Cup, so he’s pretty much a new guy to me. The new additions to the team at camp were Bob Stumpf and Andrew Seitz from Pittsburg and Gabe Moss-Masaquiza from Columbus. So our first day at camp was going to be a big insight as to how everyone’s form was going along for the season. The ride started out pretty quick, everyone eager to show their fruits of a winter spent suffering on the trainer. Being the closest thing to a Greenville local I plotted our first ride, going over the 6 mile climb Cesears head right off the bat. We clipped along for a good half hour to the base of the climb. Once we started heading up some of the newer guys were definitely going for the Strava segment, us ‘veterans’ joked about being a little over-eager, so let them go but kept things in sight. Then, after a few minutes, I blew up. I really blew up, like heart rate pegged at 180 struggling to put out 200 watts blown. Let me be clear, Caesars head is by no means a difficult climb; over 6 miles it struggles to hit a 5% average. So on the first ride of camp I went backwards so fast I finished a full 10 minutes behind everyone else in the group (you can check the strava segment). After some emergency Little Debbie snacks I was back on track to finish the ride. Sunday was our last day in Greenville, and we were all kind of looking for something short before the long drive home until our team sponsor Andy Clarke (who knows everyone and their cousin) gave us a real surprise; we’d be riding with the most decorated American cyclist still racing his bike: George Hincapie. After hearing this we spent the rest of the night as giddy as a bunch of middle school girls before a Justin Beiber concert. We met up with George and another BMC Devo racer from Michigan, Larry Warbase, and proceeded to follow them around some quality back roads of Greenville. George would rotate through taking the time to say hi to each of us. When it came to my turn I was more nervous than talking to a pretty girl (just kidding I have no idea what that’s like). I couldn’t even think about what to talk about, he asked me about my racing, I though ‘Oh man, what do I tell him about, how I’m really looking forward to Hyde Park Blast, it’s way cooler than Paris-Roubaix’. ‘Does he really want to talk about bike racing considering he spends all his time doing it.’ With all these going through my head it was pretty quiet outside. We went back through our cabin community, rode literally 100 feet past our cabin, and turned on a road we drove past 5 times without giving a second thought to. From there it was big gear workouts for the next half hour. The road, which was fully encompassed in this golf community we were staying in, was by no stretch of the imagination a safe or legal road. With at least 5 sustained pitches of 20% or more and switchbacks as tight as any one lane crit corner, this climb was harder than Brasstown, and pretty close to being harder than Nebo. During the climb I transitioned my mentality from ‘Elite’ racer to recreational cyclist. I was no longer concerned with my watts or saving the legs for the next race, I just wanted to finish the climb. As our group scattered across the road, I’d occasionally glance back to see if anyone was close enough to see me get off and walk for a while. At one point during the climb George rode up next to me. I spotted his red kit out of the corner of my vision and immediately stopped paper-boying, wheezing like a fat asthmatic kid and put my game face for George. Then his phone rang, and while I’m at the peak of mental concentration to not fall over, he takes a hand off the bars reaches around his back and answers “Oh hi honey, yeah I’ll hurry home” all not sounding like he’s doing anything harder than a recover spin. After hanging up and riding on past me, I got back to my paper-boying. We polished off the climb (which was our namesake: Panther Mountain) and snapped a few pics. After a death-defying descent off the mountain back to the front step of our cabin we said our farewells, packed up our stuff and headed back to the Midwest. Overall it looks like a great season ahead of us; everyone is super strong and really enthusiastic. Should be a good year.